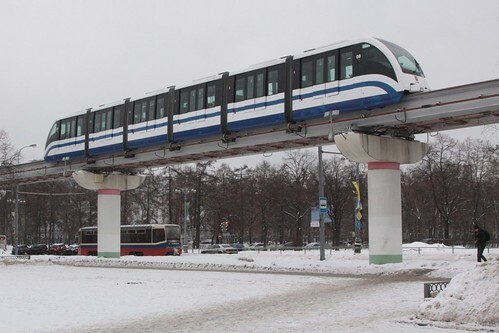 The straddle-beam monorail stretches 4.7 kilometres (2.9 miles) in the north-eastern outskirts of Moscow, connecting to Line 6, 10 and 9 of the Moscow Metro, with a total of six stations along the way, and a top speed of 60 km/h (37 mph). Wikipedia has the full history – design work commenced in 1998 and construction starting in 2001, with the first “excursion mode” train running in November 2004, but it took until 2008 for the complete system to be ready for normal public transport operations. Each train is six cars long. All monorail tracks and platforms are elevated, with station entrances down at ground level. 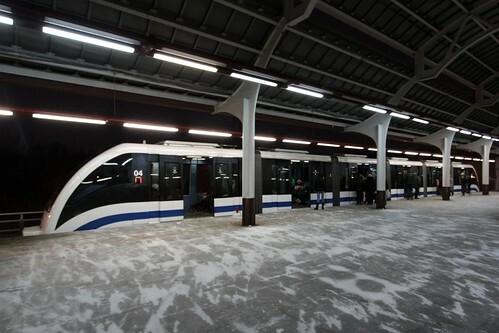 All but one of the stations have island platforms, which are open to the weather. Resulting in plenty of snow being blown inside. 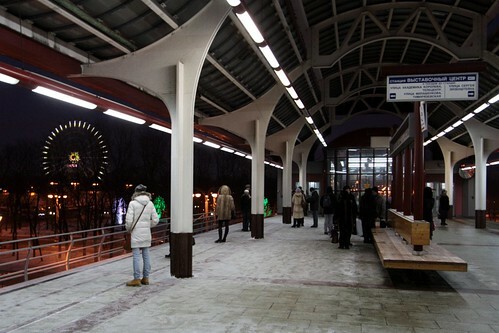 I also noticed at Тимирязевская (Timiryazevskaya) terminus an odd track arrangement – with a reversing loop for normal services. As well as a dead end siding for the stabling of defective monorail trains. When I rode on the Moscow Metro, I was pleasantly surprised by how fast trains accelerated out of stations. 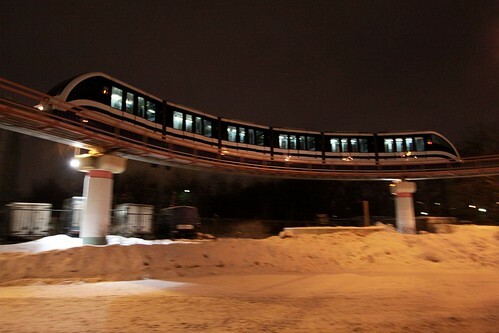 So were the Russians able to buck the trend of lame monorails, and build one that isn’t just a fairground ride? 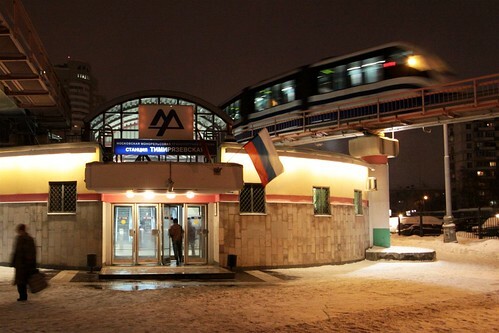 Unfortunately not – the Moscow Metro felt just as slow as the joke that was the Sydney Monorail. 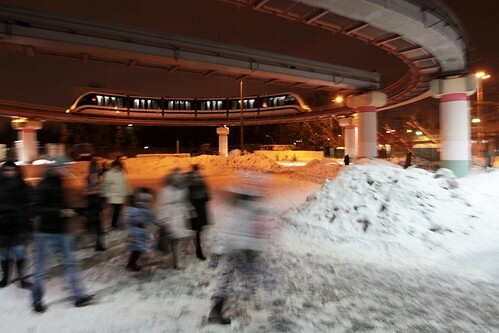 This entry was posted in Trains and tagged monorail, Moscow, Russia, snow. Bookmark the permalink.